Are you looking for a hearty casserole full of flavor and vegetables that kids of all ages love? Our Crock Pot Sweet Corn Sausage Rice Casserole is one of our favorite family dinner recipes. Prepare rice according to package and set aside. In a skillet or browning slow cooker, brown sausage until cooked through, drain and return to the skillet. Add the green bell pepper and onion to the skillet and cook for 2-3 minutes. Stir in the tomatoes and Velveeta until cheese melts. In a large bowl combine skillet contents with rice, cream style corn, corn, Mexicorn, salt and pepper and mix well. Spray a 6-quart slow cooker (or Casserole Crock) with non-stick cooking spray or use a slow cooker liner (We used this reusable one). Add mixture to slow cooker and top with shredded cheese. Cook on low for 2 to 3 hours until cheese melts and edges brown slightly. 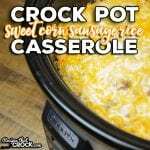 We altered a recipe from 150 Recipes in a 13 x 9 Pan to create this Crock Pot Sweet Corn Sausage Rice Casserole Recipe. We have made this recipe several times in a browning slow cooker, casserole crock and also in one of our regular 6 quart slow cookers with a reusable liner. Any 6 quart slow cooker should work fine.